I meant to blog this picture several months ago, but I’m catching up now that I’m slowly emerging from several months being too busy teaching. 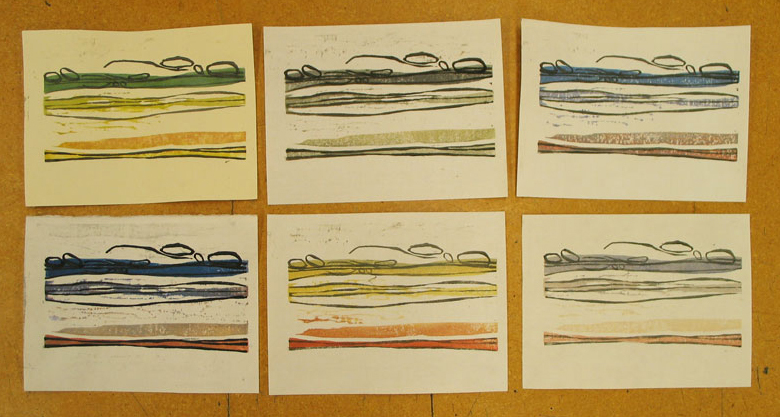 In the fall I was teaching two classes at Bethel University, Introduction to Creative Arts and Two-Dimensional Design, and I was teaching Print Paper Book Techniques at MCAD. 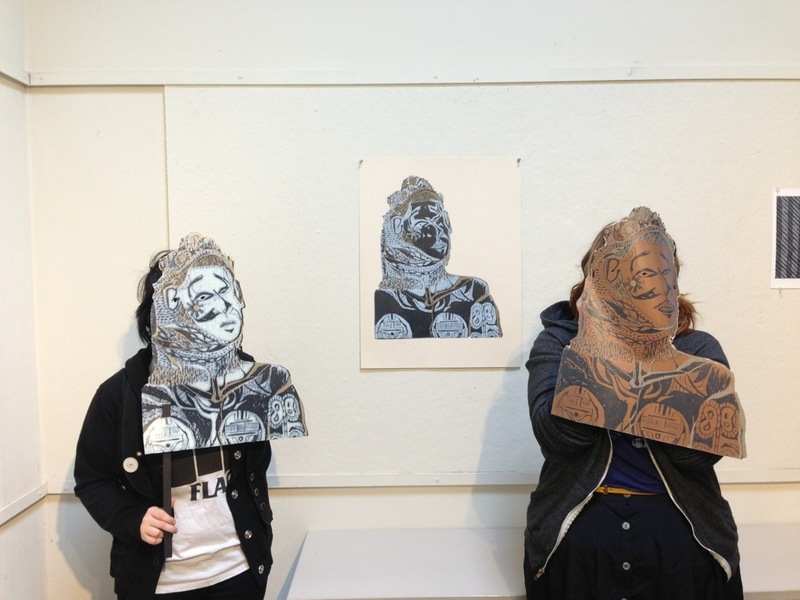 One of my MCAD students, Margarita Wenzel, made this mask for a reduction woodcut assignment. 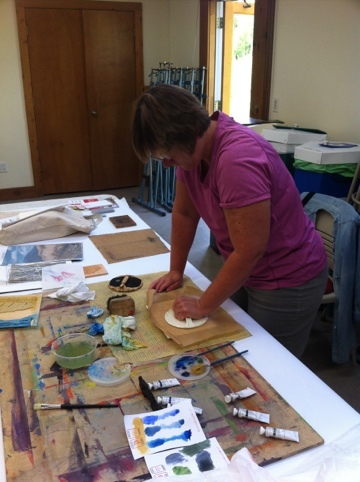 I just finished teaching a three day workshop on Japanese woodcut at Peninsula School of Art in Door County, WI. 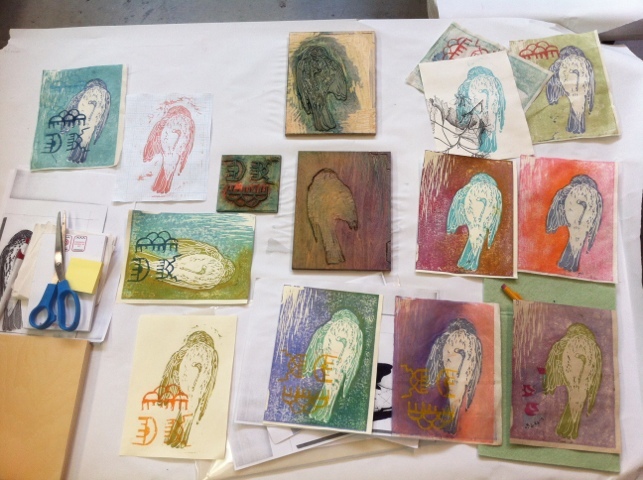 The students made lovely prints, and they all learned and accomplished a lot in three days! 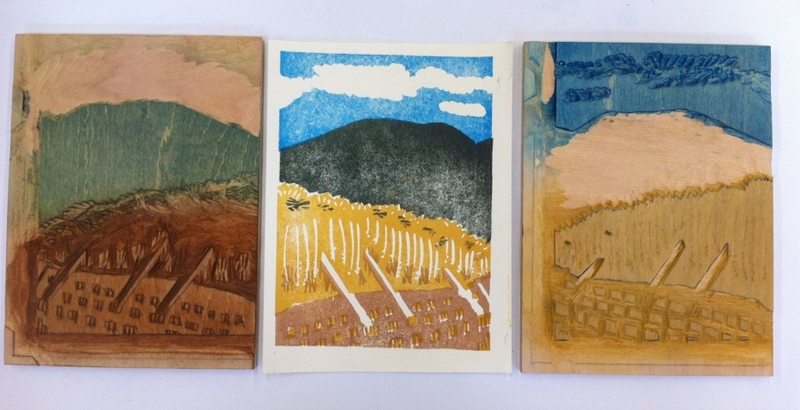 Two blocks, and print in center by Jenny, showing Japanese rice harvest and a volcano in the background. 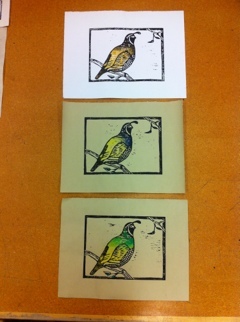 Color variations on Jenny’s print. 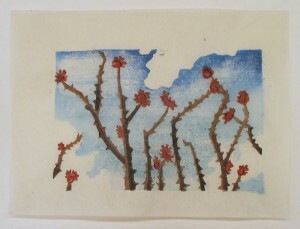 Anne’s print and blocks, a sparrow perched in a tree. Karen’s print and blocks, a dead bird and Hopi raincloud symbols. 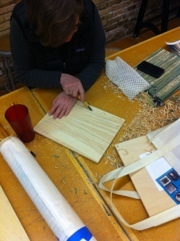 Jenny pressing with a baren. 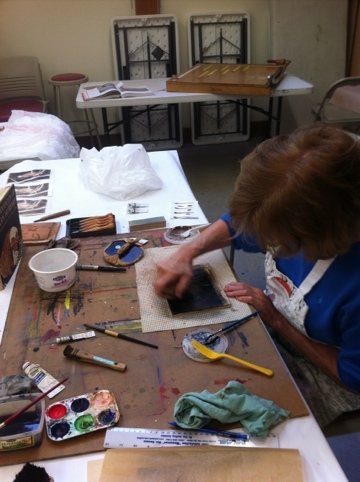 Thanks to Peninsula School of Art and my students for a great workshop! 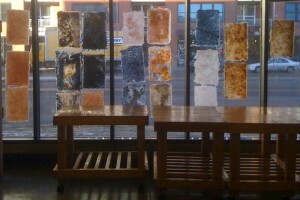 I’m excited about my students’ work on display at MCAD. 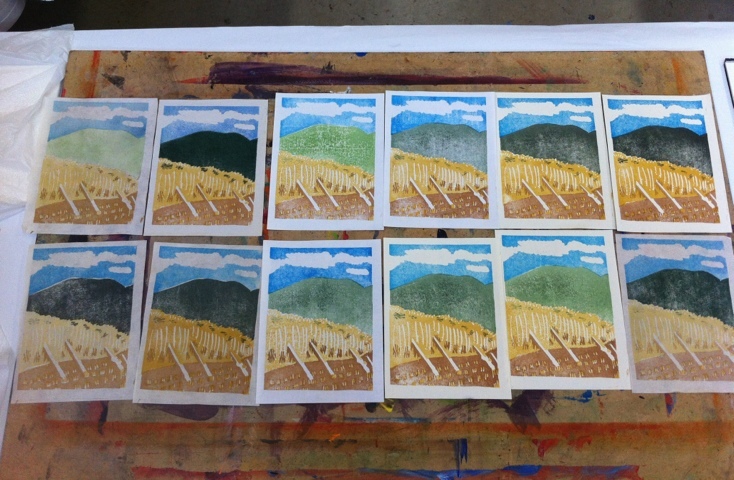 These accordion books show the results of the first two screenprinting assignments in Print, Paper, Book Techniques. 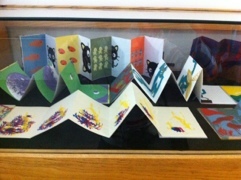 For the first assignment, students printed a pattern and then used it to cover bookboards for the front and back covers of a book. 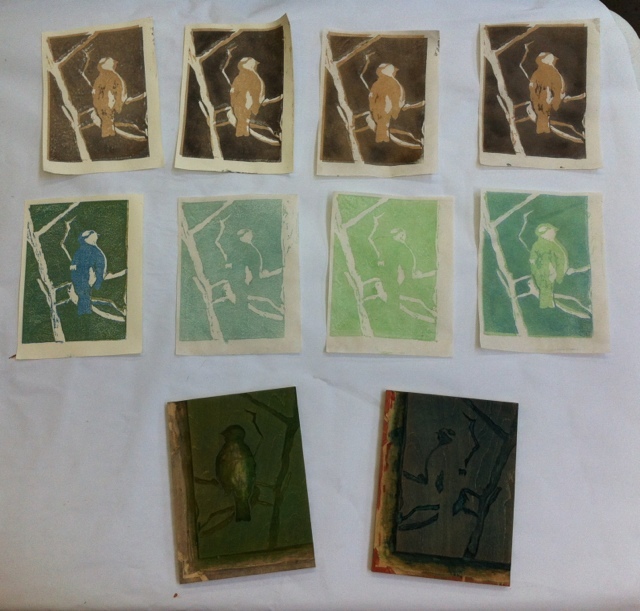 For the second assignment, students developed imagery related to their covers that showed a process, narrative, or other imagery taking advantage of the way a book unfolds over time. 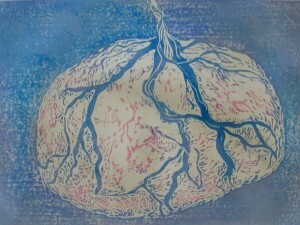 Yesterday I did the last teaching I have scheduled until this summer. I’m a little sad, but now I will focus on the apple tree print, along with prep for my summer classes, and of course, prep for the birth. 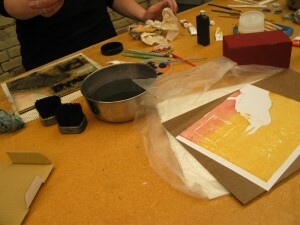 A mixed media class from Normandale came to MCBA and I taught them papermaking and pulp painting. It was a fun day and a great group of students. 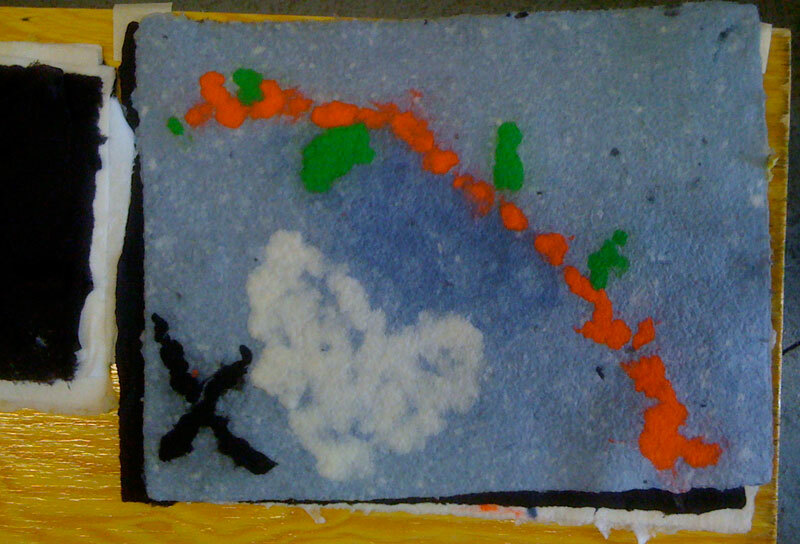 They might use their handmade paper along with some other techniques such as batik and felting in their next couple of assignments. 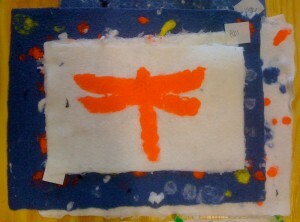 Pulp painting of a dragonfly by a Normandale student. 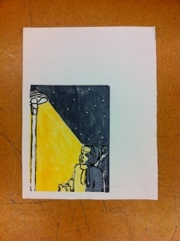 Another pulp painting by a Normandale student. 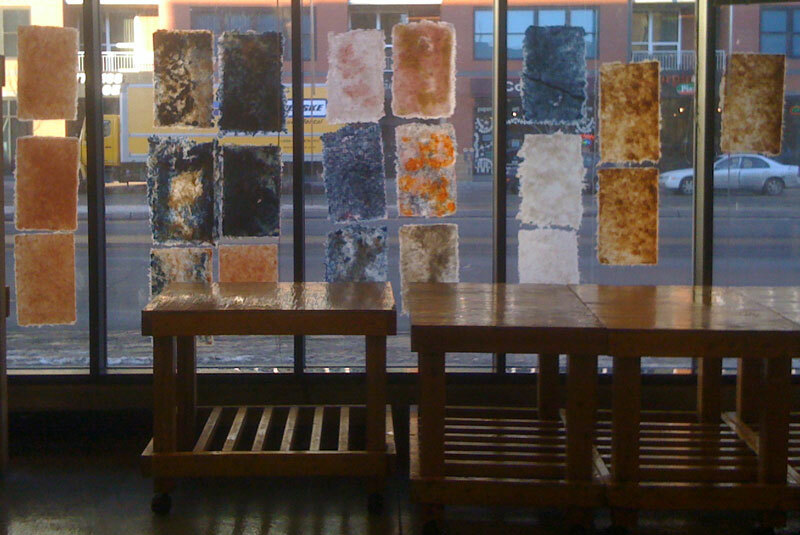 This window full of colorful sheets of paper is from my Rag Paper class at MCBA. We used blue jeans, white and orange t-shirts, pink linen, and a jute coffee bag. Students brought a playful and experimental attitude to class. 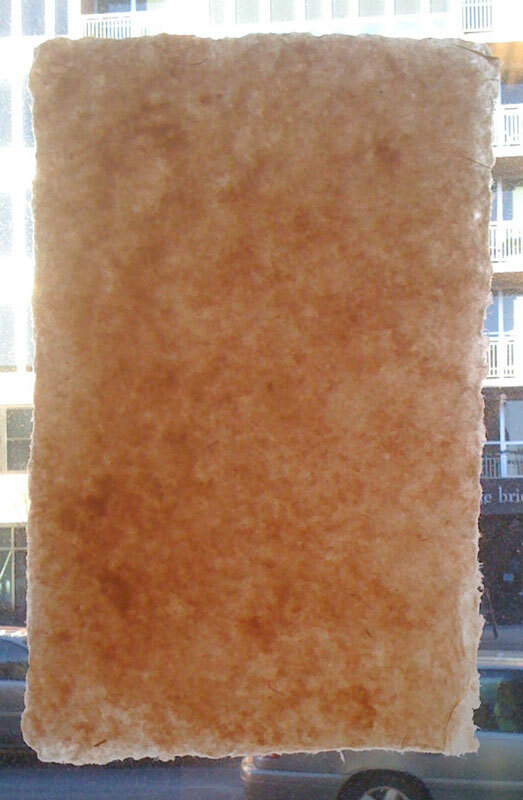 This detail shows a sheet of paper made from the pink linen with some of the coffee bag fibers mixed in for texture. 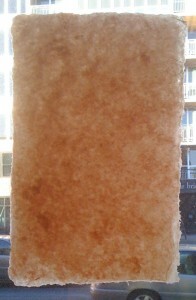 These sheets dried on the window will have one very smooth side. 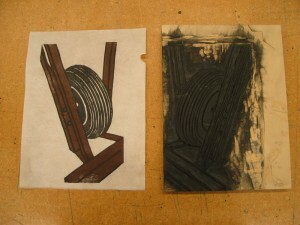 We also used several other drying methods producing different textures: restraint, spur, and air drying. I look forward to teaching this class again next year! 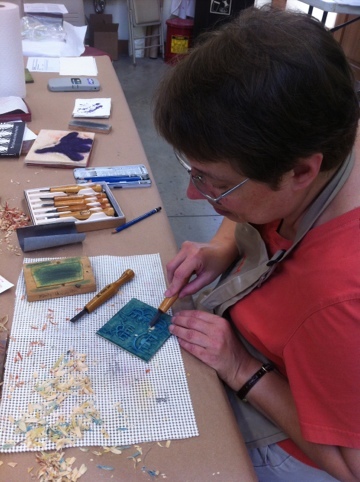 On the sixth and last session of our woodblock class at MCBA, many students felt like they were just starting to get the hang of printing their woodblocks, and wished that we had one or two more sessions. 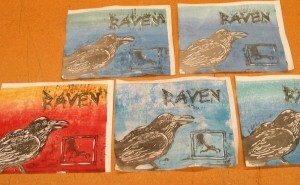 Looking at their prints, I was proud of how far they had come in six weeks. If they want to, they now have a solid foundation to continue experimenting on their own. 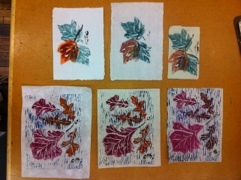 This student, a painter, was interested in using woodblock to try different color variations. 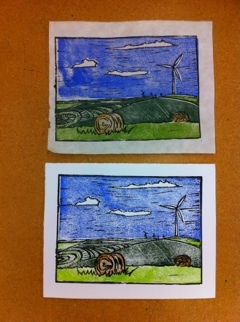 This student used imagery from her sketchbook, varying the background color. An action image of a student preparing to print a black layer on top of a gradated background. 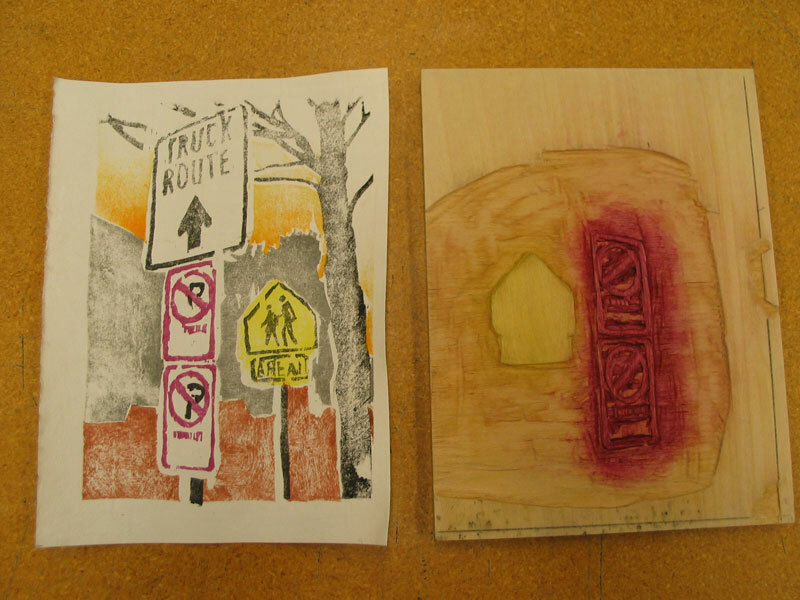 This student used a single block to print both the red and yellow signs. 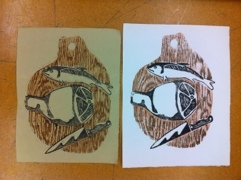 This student focused on the detailed carving of the black outline (key block). This student played up the contrast between the carved details of the thorns and the soft gradations of the sky. 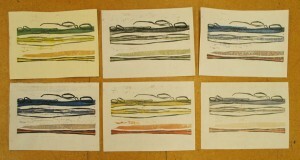 Participants print from my woodblocks. I'm the one wearing the striped shirt and gesturing. 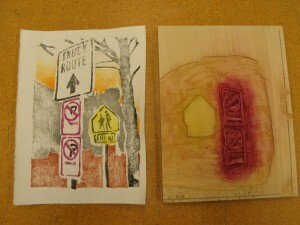 Last week I did a one-night demonstration in Japanese woodblock printing at MCAD. 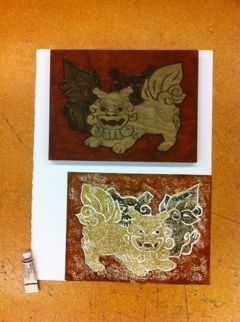 Whenever I bring my blocks for others to print, it helps me to see my old images in a new way. Some people combined things I had never thought to combine before, making me think I should give my own old blocks a second look and see if I can create new imagery by recombining them. MCAD’s flickr site has a set of photos from In the Loop events. 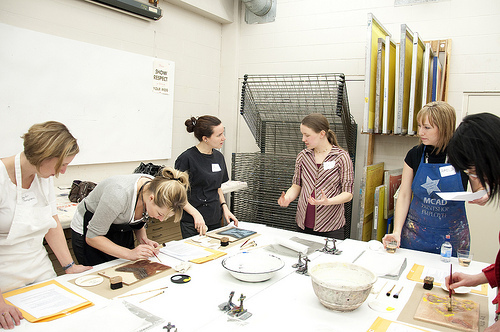 The events are designed to give a behind-the-scenes experience of MCAD. Mine was the second event in this series.